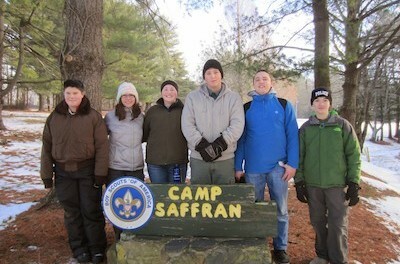 Venture Crew 276 at the camp entrance. Photo courtesy of Venture Crew 276. 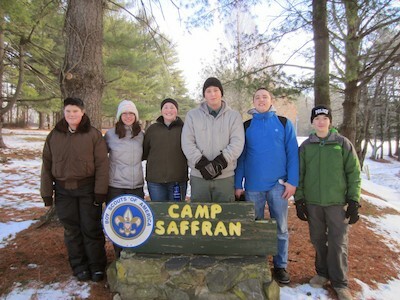 SUSSEX COUNTY, NJ – On January 9th – 11th, Venturing Crew 276 traveled down to Whiteford, Maryland for a camping weekend of shooting sports at the BSA Northeast Region Area 6 Venturing Event. Saturday morning temperatures started out in the single digits and even though it was cold, the crew was excited to participate in the weekend’s events. The day began with morning colors, announcements, a delicious breakfast outside and a mandatory safety lecture for shooting. After breakfast our crew went to different shooting stations. First, we shot .22 bolt action rifles and M1 Garands at the rifle range. Next, at the Archery station, we got to shoot compound bows at standard stationary archery targets. Our next stop was the Tactical Tomahawk throwing station. Here we got to throw tomahawks at playing cards mounted to logs in an attempt to slice the card in two. Several crew members were able to hit the cards. After tomahawks, we went to the Shotgun shooting station. Here, we got to yell “pull” and shoot at clay pigeons. After a full morning of shooting, it was time for lunch. Lunch again was outside as it had warmed up to 16 degrees. After lunch, the crew visited the sling shot range where we attempted to knock over cans using sling shots. Our next stop was an historic gun collection that had dozens of guns from WWI to modern times on display. At this point, we all took a short break to warm up by a fire. After the break, crew members went to the Action Archery where they got shoot arrows at moving targets. Some crew members then participated in the dart throwing station while others returned to stations they had previously enjoyed. At evening colors, two of our crew members were selected to participate in the color guard. They were in charge of lowering, folding and transporting the flags. After dinner, there was a brief ceremony where selected Venturers, including 9 members of our crew, were inducted into the Venturing Corps of Discovery, a service society within Venturing. After our induction, we spent fellowship time with other crews by engaging in conversation and games around a warm fire. The next morning, it was a cool 7 degrees at wake up! After breakfast, we broke camp and made the 4 hour trek back home. Overall, this was a great event for all who attended and we look forward to next year’s Top Shot Winter Rendezvous. Venturing is a youth development program of the Boy Scouts of America for young men and women who are 14 through 20 years of age. Venturing Crew 276 meets monthly in Byram Twp at the Lakeland Emergency Squad building. More information on the crew can be found at venturecrew276.com.